Nothing says spring to me like strawberries and rhubarb. And, now that I’m living in Florida, I have the pleasure of getting local strawberries. I’m sure I’ve bored you all before with my rants on fresh local ingredients, but the simple truth is… the shorter the distance between you and your food, the better. I was in the grocery store this afternoon and the sale was 3 pounds of local strawberries for $5. I wasn’t really shopping for fruit. In fact, I was there getting a toothbrush, but I couldn’t resist this deal. The rhubarb was cleaned and broken down and conveniently merchandised right next to the strawberries. It was kismet. Dessert was a must for tonight. Here’s the full recipe. Make this soon, as rhubarb season is short and the frozen stuff just isn’t the same. Start by making the crust. Combine the dry ingredients together and then cut the butter into the dry ingredients with your fingers until the mixture resembles cornmeal. In a separate bowl combine the wet ingredients. Add the the wet to the dry and kneed to combine. Once everything is incorporated, chill the dough for approx. 30 minutes. While the dough is chilling, make the filling. Combine the fruit with the sugar and allow to macerate. Preheat the oven to 375 degree. When the dough is chilled, roll it out into a 14-16 inch circle. place all of the filling in the center of the dough leaving a 3 inch border around the sides. Then fold the edges in toward the center leaving a 2 inch hole. Brush the dough with egg wash and sprinkle with sugar. Bake for 35-45 minutes or until the dough is GBD (golden brown and delicious.) Serve at room temp with either vanilla ice cream or whipped cream. 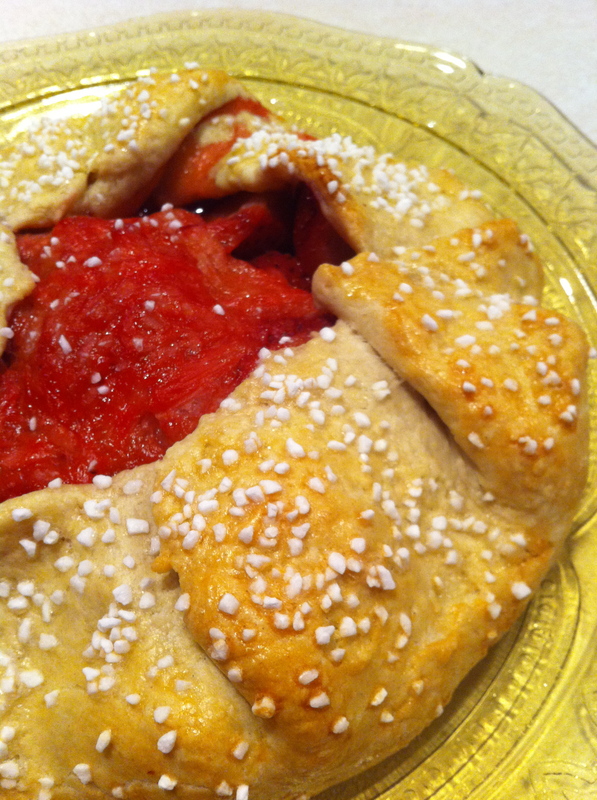 This strawberry and rhubarb galette looks amazing! I’ve never tried or baked anything like this before. I can’t wait to give it a try. Nice post.